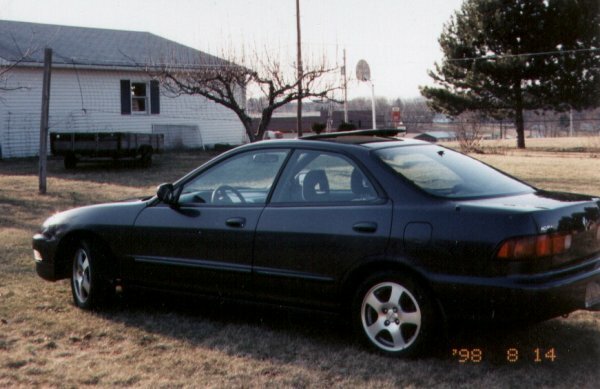 I own a 1995 Stealth Grey Integra GS-R Sedan. 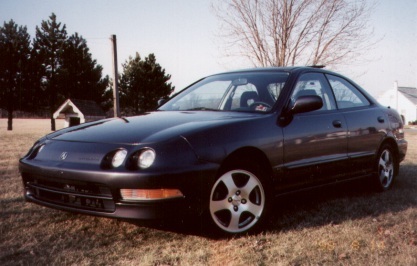 The Acura Integra GS-R is a very fun car to drive due to its great handling and awesome VTEC engine. The VTEC enables the GS-R to put out 170 hp at 7600 rpms and have a red line of 8100 rpms. So it is almost like driving a motorcycle. The car loves to rev, and when you rev the car past 6000 rpms a larger set of valve lobes kick in and the car just takes off. The engine sounds awesome and that surge of power makes you feel invincible. The Integra also has a great gear box. It 's a close-ratio five-speed manual which makes each shift short and crisp. The Acura Integra GS-R has received some great reviews from many popular car magazines. In the November 1995 issue, Car & Driver Magazine did a comparison test between the Integra GS-R and BMW 318ti and the Integra GSR came in first place. The average price of the Acura Integra GS-R new was about $22,000 which was a bargain considering its superior performance and handling characteristics. 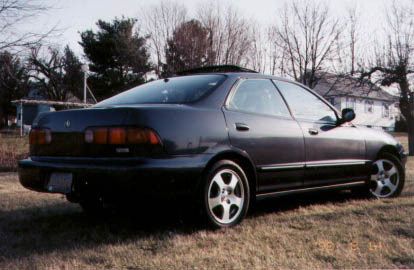 Unfortunately Acura has stopped producing the Integra, but you can find some great used Integras on traderonline.com. The Integra GS-R accelerates to 0-60 mph in about 7.3 to 7.6 seconds (depending on the driver). The Porsche Boxster does it in 6 seconds. So the Integra GSR is only about 1.5 seconds slower than a Porsche! Also the Porsche Boxster is $25,000 more. The innovative VTEC engine allows the Integra to accelerate this fast. VTEC stands for Variable Valve Timing and Lift Electronic Control. The VTEC engine system maximizes engine efficiency across the entire rpm range and helps combine abundant low- and midrange torque with a remarkable 170 horsepower-all from a fuel efficient, 1.8 liter, four-cylinder design. So far I haven't made any modifications to the engine, but I plan to in the future. The only thing I upgraded to enhance the performance of the car is tires. As all Acura Integra owners know the stock Michelins are very bad tires. They don't grab the road well in the rain or on dry land. To fix this I bought Pirelli 205-50-15 P700z tires from the Tire Rack. They were only $63 each and they greatly enhance the cornering and the traction of the car. Well as mentioned above the Acura Integra is no more. It is now called the Acura RSX. The Acura RSX Type-S has taken the place of the Integra GS-R. The 2005 Acura RSX Type-S comes with a 2.0 liter iVTEC engine which puts out 210 horsepower at 7800 rpms and is mated with a six-speed manual. This car has recieved a lot of rave reviews because it is faster and more refined over its predecessor the Integra GS-R. From what I have heard the only downfall of the RSX is that the driver is more isolated from the road due to the fact it is more luxurious than the Intgra. Acura has also recently unveiled the Acura TSX which is a four door sports sedan. TSX costs about $5000 more than the RSX, but will probably be my future car although I will have a hard time giving up my Integra. I still enjoy driving it everyday.